Enjoy new environments or biomes in your worlds of Minecraft. Enhanced Biomes 1.7.2 and 1.7.10 adds yet a total amount of 100 new biomes with up to 23 variants, which have a lower bouce rate. These new places are built by the combination of the deafult game blocks with new ones, which give as a result new biomes with new possiblitites. The new materials are 6 new stones and 15 different trees, that when are mixed with the rest of the block games, make new biomes. However, not all of the stuff is related to biome modifications because the villages will also have changes and they will appear in more numbers of biomes. 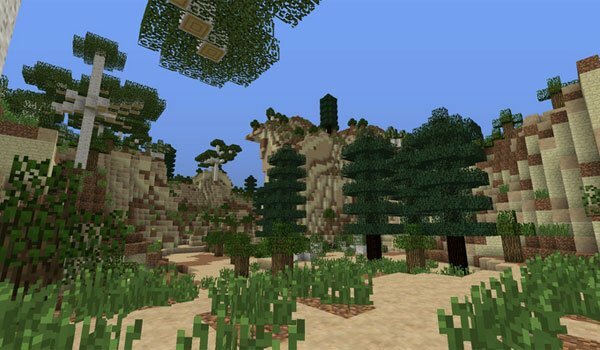 How to install Enhanced Biomes Mod for Minecraft 1.7.2 and 1.7.10? New biomes, materials, trees and villages!